The land to the south of the houses on the Rectory Farm development is designated as 'restored landscape' to which the public will have access. The Parish Council was greatly concerned to discover that mature trees had been felled unnecessarily on this part of the site, which it considered was not a promising start to landscape restoration. Looking more closely at the management plan for this area, there is concern that it is not appropriate for open space on the edge of a village, with too much closely mown grass and too little wildflower and tree planting. "The current design is more like a small municipal park than the community meadow and woodland suitable for a small village," says Council chairman Andrew Cooley. 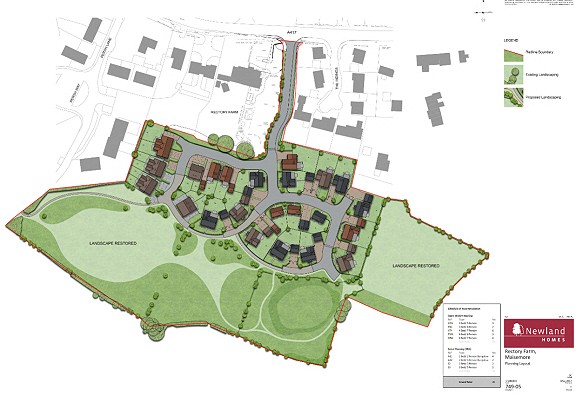 In order to ensure that this open space is managed sympathetically and for the benefit of both residents and wildlife the Parish Council has resolved in principle to adopt the area of ‘Restored Landscape’ and the attenuation basin and its surrounding area on the Rectory Farm development, subject to a satisfactory agreement and financial arrangement with Newland Homes, Tewkesbury Borough Council and Severn Trent. Newland homes are currently putting a temporary car park at the site access on Persh Lane for use by their staff while the main entrance to the estate is being constructed.